– Her headache was due to the noise coming from upstairs. – She had a headache because of the noise coming from upstairs. On sentence 1, there is the noun ‘her headache’ and the linking verb ‘was.’ To make sentence 1 a complete sentence, we need a complement. The phrase ‘due to the noise coming from upstairs’ is this complement. Although sentence 1 & 2 are similar, sentence 1 was actually meant to say that there was a noise from upstairs and her headache came as a RESULT to this noise. Meanwhile, sentence 2 explained that THE REASON she had a headache was that noise coming from upstairs. Are you still unsure, fellas? Let’s take the following exercise. a. My brother’s success is ______ his hard work. b. My brother is a successful person ______ his hard work. c. She failed ______ not studying. d. Her failure was ______ not studying. @dindaaark: a. Due to. b. Because of. c. Because of. d. Due to. @notevennurul: A. Due to. B. Because of. C. Because of. D. Due to. @cynthiatika: a, d : due to. b, c : because of. ‘Due to’ is an adjectival phrase. It gives more detail to the noun. It identifies the result of an event. It always comes after linking verb ‘be’ (is, am, are, was, were, will be, etc.). ‘Because of’ is an adverbial phrase. It gives more detail to the verb. It identifies the reason why something happens. It always comes after subject + verb. A lot of her unhappiness is due to boredom. She is unhappy because of boredom. The bus’ delay was due to heavy snow. The bus was delayed because of heavy snow. A: Seperti penjelasan admin sebelumnya, ‘due to’ memberi keterangan pada subjek, sehingga jika sudah menggunakan ‘due to,’ frasa yang mengandung verba bisa tidak dicantumkan. The game’s cancellation was due to adverse weather conditions. Her five days of work was due to illness. The captain’s withdrawal from the match was due to injury. Compiled by @alicesaraswati for @EnglishTips4U on Wednesday, 13 June, 2018. One of the boys is caught smoking at school. One of four men prefers having the first date at the cinema. The sentence ‘You’re not going nowhere’ or ‘I don’t have no money’ is considered informal and so should be avoided when writing. When it comes to learning English, I think grammar could be named as one of the most delicate topics. Some friends of mine even gave up trying to understand grammar and there are people who usually have many questions about grammar. Basically, ‘another’ means one more (of the same things) or an alternative, while ‘other’ means some more or some alternatives. I would like another cup of tea, please. If you are not satisfied with the hotel room you booked, you can ask for another. Although I have some other dresses, the strapless one is my favourite. These oranges are rotten. What about the other ones? Now, what about ‘others’? When should it be used? Man: Some people are already here. Woman: Good. What about the others? These pants are too short. Do you have others? “For a start, instead of ‘because’, the one synonymous with ‘due to‘ is ‘because of‘. ‘due to‘ grew up as an adjective and modifies a noun (or pronoun), while ‘because of‘ grew up as an adverb and modifies a verb.” – Eng vocabulary ‏@x_sg24 . Rossi’s defeat in this year’s MotoGP is due to an accident in Sepang. Rossi was defeated in this year’s MotoGP because of an accident in Sepang. A lot of climbers were lost because of the storm. A lot of climbers lost their way due to the storm. The man whom I had a fight with last night is my boyfriend. Whom are you coming with? Hey, whose computer is this? May I use it? I don’t care whose son he is. He still needs to mind his manners. “Sons and daughters of Indonesia” actually is okay. It is the same as “children of Indonesia”. Although “the youth” or “the young generation” is fine too. “Sons and daughters” is just adds up a bit. More specific. @abd_chaniago: @sierrapritta but “sons and daughters of Indonesia” sounds so damn cool! Well then, Happy Indonesian Children’s Day to all :) May our young generation gets better and better :D Yeehaaa! Today admin will discuss some word differences that some of you asked a while ago. Someone asked: what is the difference between “home” and “house”? Home: a place where you live. | House: a building in which someone can live in. “Home” lebih ke arah emosional sementara “house” lebih ke arah material. Ada pepatah bilang: A home may be a house, but a house isn’t always a home. Contoh (home): I’m staying alone far away from my family but my friends here make me feel like home. Contoh (house): I want to buy a decent house next month. Victory: kemenangan (berhasil mengalahkan seseorang). | Glory: kejayaan (atas kemenangan). Contoh: Members of the team gloried in their victory. The difference between “if I was” and “if I were”? Secara grammar, “if I were” yg benar. Tapi dlm percakapan sehari2 “if I was” juga tidak salah u/ digunakan. Jangan lupa, karena “if I were” adalah ungkapan seandainya, maka tense yang digunakan adalah past tense. Contoh: If I were you, I wouldn’t eat your sister’s cake. “Good evening” dipakai u/ menyapa seseorang di malam hari. | “Good night” dipakai jika kita berpisah dgn org tsb. “Good night” sama seperti “good day”, hanya “good day” kita pakai di siang hari. “Believe” artinya kita merasa bahwa sesuatu itu benar. | “Believe in” berarti kita memercayai sesuatu/seseorang. Contoh (believe): I believe you (Arti: Aku rasa kamu mengatakan hal yang sebenarnya). Contoh (believe in): I believe in you (Arti: Aku memercayaimu). Seperti halnya belajar bahasa Indonesia ketika kita kecil, belajar bahasa Inggris tidak harus diawali dengan belajar struktur/grammar. Hal pertama yang paling penting dilakukan adalah membiasakan diri dengan bahasa Inggris itu sendiri: listening, speaking, reading, writing. Cari cara yang menurut kita paling enak dilakukan, bisa dengan sambil menjalankan hobi. Seperti anak kecil, kita meniru terlebih dahulu. Tapi ingat: tirulah yang benar. Dengan banyak listening dan reading, kita akan dapat banyak masukan dan melihat pola penggunaan kalimat dan lain-lain yang benar. Setelah mendapatkan banyak masukan, waktunya praktek dengan speaking dan writing. Di tahap ini, jangan pernah takut salah, yang penting latihan. Nah, setelah banyak latihan, pasti jadi lebih percaya diri. Di tahap ini, yuk mulai belajar grammar (termasuk tenses), tingkatkan skill. @HelmiSaputra_: pelajari dulu pronunciation + daily expression. Building up self confidence to speak is better learned early. @fajrinamaya: utk self learner lebih baik biasakan reading & hafal vocab. Nah abis itu baru kombinasiin dgn grammar & listening. @DewaNikira: dulu diajarin baca artikel pke bhs inggris smbl ngigit pinsil sejajar bibir biar pronunciationnya oke. Coba deh. Q4. @TretnoH: Biar salah,ttp dilatih ya min?? A4. Betul. Jangan lupa poin terakhir: jangan pernah berhenti belajar dan memperbaiki diri. Q5. @Mintauly_Dbtrj: some peolpe will judge me arrogant when I used english tp talk with them. A6. Hmm.. Satu-satunya cara ya lebih sering ketemu orang asing (bule) kalau begitu. Biar biasa dan ga grogi. Hehehe..
Q7. @laeardo: kalo orangnya ngomong ‘sok inggris lo. bangga dong ama bahasa indonesia.’ gimana min? Q8. @lintangmahda: Tapi kalo kita salah trus yg lebih pinter malah ngeremehin/ketawa gimana? A8. Cuekin + cari tahu yang benar + perbaiki. Q9. @muthiakharisma: Admin kadang kadang adaloh kalo dikasih tau yg bener malah balik sewot, jadi gimana tuh? #EngQAs – Question #3: Can you help @NashSakina and @Armia_RA on the differences between “if I was” and “if I were”? 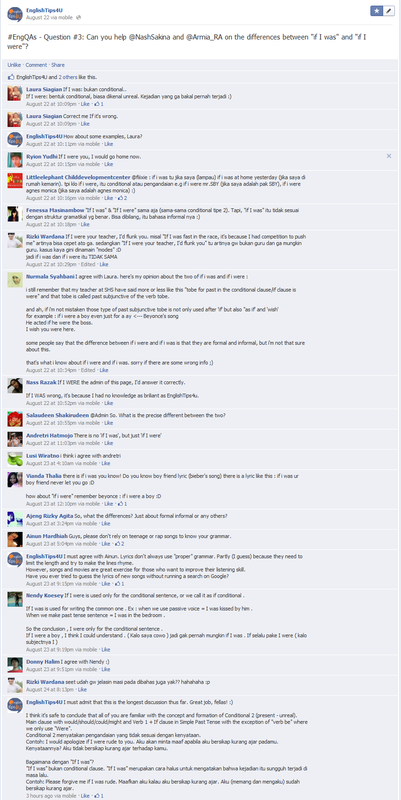 I must admit that this is the longest discussion on our Facebook account thus far. Thank you for your participation Laura Siagian, Ryion Yudhi, Littleelephant Childdevelopmentcenter (@fiiixie), Fenessa Masinambow, Rizki Wardana, Nurmala Syahbani, Nass Razak, Salaudeen Shakirudeen, Andretri Hatmojo, Lusi Wiratno, Vianda Thalia, Ajeng Rizky Agita, Ainun Mardhiah, Nendy Koesey and Donny Halim. I think it’s safe to conclude that all of you are familiar with the concept and formation of Conditional 2 (present – unreal). Main clause with would/should/could/might and Verb 1 + If clause in Simple Past Tense with the exception of “verb be” where we only use “Were”. Conditional 2 menyatakan pengandaian yang tidak sesuai dengan kenyataan. Contoh: I would apologize if I were rude to you. Aku akan minta maaf apabila aku bersikap kurang ajar padamu. Kenyataannya? Aku tidak bersikap kurang ajar terhadap kamu. Bagaimana dengan “If I was”? “If I was” bukan conditional clause. “If I was” merupakan cara halus untuk mengatakan bahwa kejadian itu sungguh terjadi di masa lalu. Contoh: Please forgive me if I was rude. Maafkan aku kalau aku bersikap kurang ajar. Aku (memang dan mengaku) sudah bersikap kurang ajar. 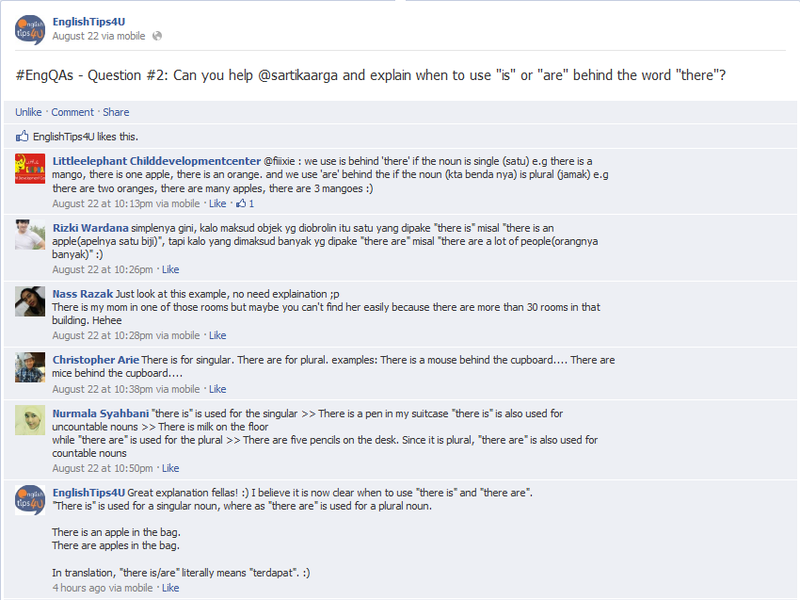 #EngQAs – Question #2: Can you help @sartikaarga and explain when to use “is” or “are” behind the word “there”? Thank you for your participation Littleelephant Childdevelopmentcenter (@fiiixie), Rizki Wardana, Nass Razak, Christopher Arie, and Nurmala Syahbani. As discussed and shared, “There is” is used for a singular noun whereas “there are” is used for a plural noun. There is an apple in the bag. There are apples in the bag. 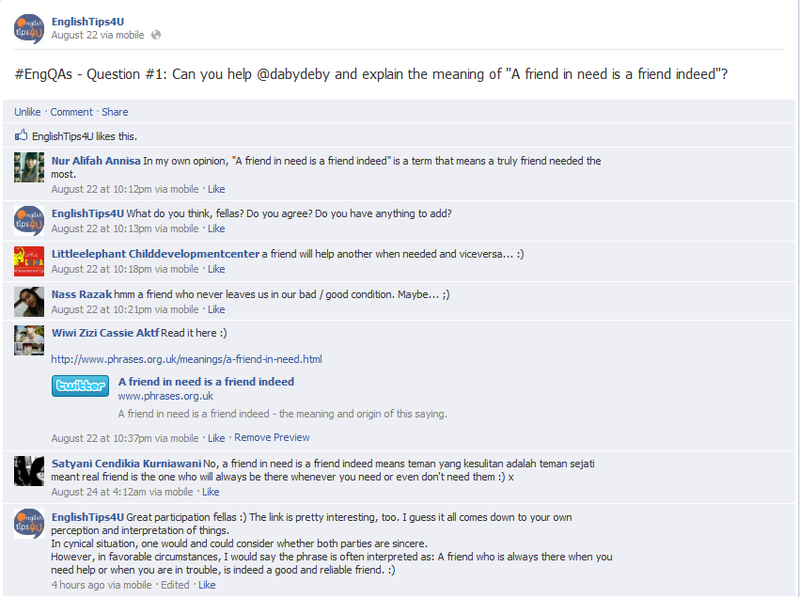 #EngQAs – Question #1: Can you help @dabydeby and explain the meaning of “A friend in need is a friend indeed”? I guess it all comes down to your own perception and interpretation of things. In cynical situation, one would and could consider whether both parties are sincere. Q1. @DoeanaKareem: min bahasa ingrisnya kamseupay apaan min? Ada ga? A1. Tidak semua kata dalam Bahasa Indonesia bisa diterjemahkan langsung ke Bahasa Inggris (juga sebaliknya), terutama yang berhubungan dengan budaya. Karena “kamseupay” = singkatan dari “KAMpungan SEuukaleee Uuhhh PAYah!”, jadi menurut admin = “How lame/pathetic!” Untuk pertanyaan ini, jawaban admin = pendapat admin. Yang punya pendapat lain, silahkan. It’s open to all interpretations. A3. pronoun “they”/ possessive adjective “their” kadang digunakan sebagai pengganti “he/she” atau “him/her” untuk menghindari bias gender. Q4. @cinta_santika: mau tnyak bhasa inggrisnya ‘habis manis sepah dibuang’ apa? A4. habis manis sepah dibuang = tidak ada terjemahan pasti, tapi kita bisa bilang: forsaken, forgotten, being used, taken for granted. Q5. @widyayudewanti: I read in twitter there’s sentence like “le cry to you”/”le love u”. What does “le” mean? Is that a slang word? Q7. @SariniSQAIRIA: ap sih artiny “you do the math”? A7. RT @brihaspaty_: ‘itung sendiri deh..
A8. “I gots to know!” = “I got to know!” atau “I have got to know!” (Aku harus tahu!). Coba baca ini: What does “I gots to know” mean? Q9. @K_fresa: pernah streaming kejuaraan , ada orang ngomong “don’t break a leg!” maksudnya apa min ? A9. don’t break a leg = jangan bekerja terlalu keras/berhati-hatilah. Ada penjelasan yang cukup bagus di sini: What does, “don’t break a leg,” mean to you? Q10. @zakilaili: Bahasa Inggris dari “piala bergilir”. A10. piala bergilir = rotating trophy. Q11. @windiyas: bhs inggrisnya salting apa ya? A11. salting = salah tingkah = kita bisa gunakan: feel embarrassed/awkward/nervous, don’t know what to do. Q1. @vivitpramita: bisa bantu cari lagu untuk belajar past tense gak? @Dittakrisna MICHAEL JACKSON – I LIKE THE WAY YOU LOVE ME. ‏@sandhykeyz O+S – The Fox. sekalian belajar puisi. Q2. @diyantoliau13: min, Saranin portal berita indonesia yang pake english? Thanks” ada yg bsa bantu? Q3. @nunoyy: nyoba download ebook shakespeares yg romeo juliet buat persiapan msk sastra inggrs, tp gangerti bahasanya =( ada tips ga min? Q1. @adwandikaa: admin ada kalimat ‘I was cool before I went mainstream’ maksud ‘mainstream’-nya ini apa ya? Thx. A1. Admin: Sudah buka kamus? Seperti yang disebut @NiaFadhillah mainstream juga brarti pasaran atau apa yang sedang ngetren. A2. Admin:You just have to make sure it changed or not in English. It’s been agreed that way, did we ever ask the English to change their difficult words? No, so we both have to accept. @fachryspears: But if we keep the words in Indonesian, foreign people (esp. Western) will have difficulty to read it. @winaz: It may be difficult, but that should enrich the knowledge of other language for them… Just like not all English words have Indonesian translation, that’s the beauty of different cultures. @naesruup: There’s no other way to translate words that we don’t even know the meaning. @winaz: Sometimes, the best translation is the explanation of the things… not simply in one single word. @naesruup: If u know d meaning but no equal word in L2, better to keep it original but put a little explanation after it. Admin: Rice could be adapted (you can try search it). Well, what’s the reason for you that everything has to be in English then? @naesruup: Some words don’t have to be translated word by word, u just hv to keep d message, culture and art of it. A1. Admin: Have you looked up in Google? Or any fellas wanna help? Kebanyakan fellas menjawab FYI = For Your Information, yang artinya ‘sekedar info untuk Anda’. Biasanya dignakan secara informal. Q2. “@habib_CR7: punya recommendation situs tentang literature ga?” Ada yg bsa bantu fellas? Q3. “@AnnSlowbeh: min, roll the credit artinya apa?” Ada yg tahu? A4. Admin: Barney disini spertinya berarti suatu yang aneh/awkward. Jadi: tegang karena tidak ingin mendapatkan keanehan dengan negara-negara ramah tentang masalah/isu itu. Ada pun di Australia -> Barney = argumen, jadi: tegang karena tidak ingin ada argumen dengan negara-negara bersahabat tentang isu ini. That’s it, fellas. Thank you for your help! Have a good Friday! Hope all is well. :) Keep on learning and good night! Q1. @Ghobbib: utk mengagumi seseorang pakenya adore, admire atau rave??? @TedWhiteblood: Frequently look up oxford dictionary/thesaurus. Q3. @larasarianto: kryptonight itu apa artinya sih – maksudnya kryptonite? A3. @dianesque: kryptonite: weakness or something/someone that you have to stay away from because it’ll harm you. tambahan: even though you want it so bad. Misal: I love her but she’s currently in r’ship. She’s my kryptonite. @duriodarno: kalo kryptonite,bs jd maksudnya “kelemahan” mengacu dr film Superman.ex: Math will always be my kryptonite. Q4. @mars_scofield: artinya slippin through fingers apaan ya? A4. Admin: terlepas dari genggaman. @TedWhiteblood: 1. Accidentally you lost your hope/dream. 2. To escape from someone. Q5. @Akbarbani: bedanya town sama city apaan selain town lebih kecil drpd city? A5. Admin: town = kecamatan, city = kota. @alaliflif: Coba buka kamus. Town memang lebih kecil dari City. Sama arti, beda makna. City buat “pusat” kota, town buat kota. Q6. @tiaratirro: maksud dari ‘falling in your shoes’ apa ya? suatu idiom kah? A6. @TedWhiteblood: falling atau filling in someone’s shoes? Kalo fill in someone’s shoes artinya replace someones position. @schordion: It was quite difficult for the listening section. Q1. @heni_febri: min, b.ing nya darah seni telah mengalir dlm dirinya begini bkn ‘art blood has flown in her soul’?” Fellas? Bs bantu? @puteriwidya: tp, darah seni gak bisa ditrjmahkan jadi “art blood” krn art is not kind of blood. Blood is not an art. Q2. @dafinabee: aku klo speaking udah gak sempat mikir grammar, gimana dong? A2. Admin: setelah bicara, pikirkan lagi sudah benar atau belum. Kalau ragu, baca-baca kembali. Q3. @CalvinJonathanF : min, mau nanya deh. Arti sebenarnya dari “whatcha gonna do?” Itu apa ya? Artinya “apa yg hrs kita lakukan” bener gk? A3. Admin: whatcha baru dibahas Selasa kemarin. Coba lihat TL/blog tentang ‘What’s up?‘. Admin: grammar penting untuk dikethui dalam berbahasa Inggris. tidak tahu = resiko salah. Cara agar tidak pusing dengan grammar adalah dengan terus belajar, hafal rumus, baca, dengar serta latihan bicara dan menulis. ‘@Panditha88: Berbhasa tdk ad benar atau salah RT tdk tahu=resiko salah’ – salah dalam artian penyampaian/pengertian si penerima bisa salah. Q5. @apinVinoot: min, bantuin cari definition of skimming in reading donk.. Tapi menurut para ahli..
A5. Coba Google dulu ya/cari bukunya. Trims. @indahpmt: penasaran deh min :D ada yg msh kuliah atau udh kerja min?